When limeños visit friends, they are usually greeted with either chicha morada or a sweet and syrupy refreshment called agua de manzana. 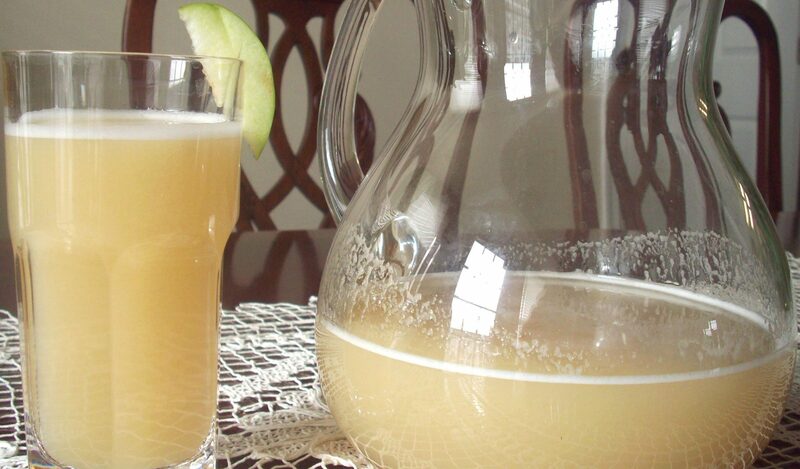 This apple nectar is very popular, and people say it has relaxing qualities and keep your mind sharp and clear because of the apples. This is why it´s commonly known as “agua de loco” (crazy man´s water), which, of course, is a joke. We love it, funny name and all, and it´s one of our favorite beverages for any given day. In Peru we don´t buy bottled juices for the house on a daily basis, because, as is the case with food too, we are used to preparing them from scratch, only with fresh fruits. That´s probably one of the reasons we have sturdy, healthy bodies in general. All those sweet and colorful fruits we buy every day at the market, fresh and cheap, and full of nutrients are the healthiest thing we can give our bodies. Bottled drinks are an occasional treat that we buy only on special occasions, for a BBQ, the beach, or a Sunday gathering. It´s no surprise that our fondness of juices and fresh drinks of every kind has seen an outburst of many juguerías, (juice parlors) in the last decade, where customers can find exotic and refreshing juices year round. However, apple water is mostly found at homes, and there is nothing warmer and more welcoming than the aroma of apples and cinnamon perfuming the house. 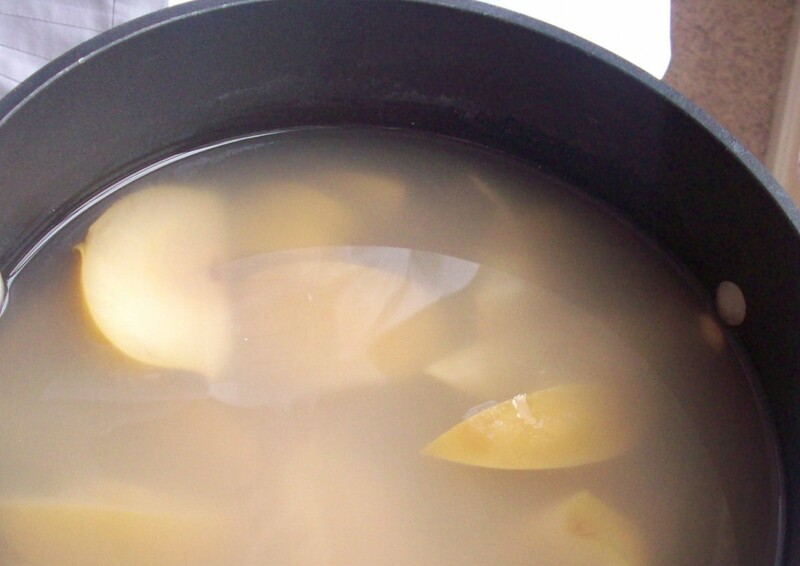 To make this water we use creole apples, which are very tart and almost dissolve while cooking, but you can use whichever apples you like, adding a few tart ones to give the drink a good flavor. Cinnamon is a must. Instead of apples, you can also try passion fruit, pears, or star fruit for a thrilling variation. 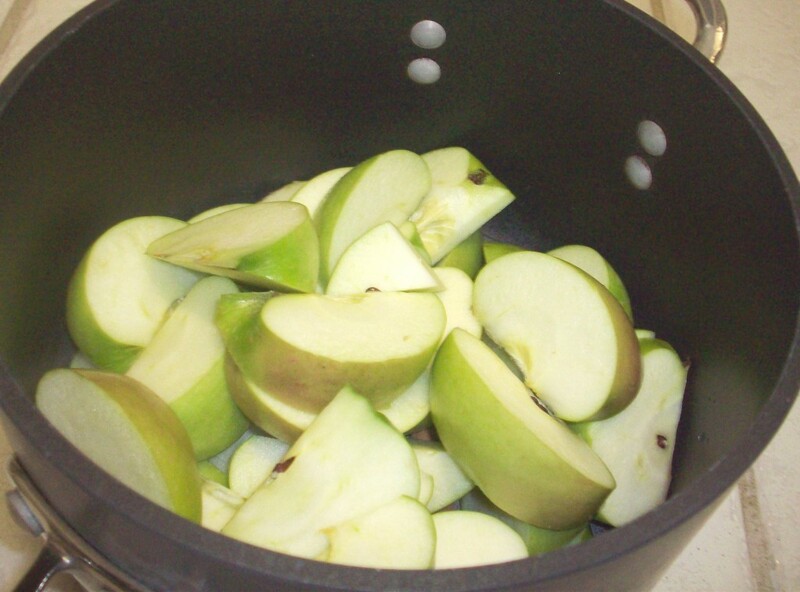 *Chop the apples coarsely and put in a heavy saucepan with cinnamon, allspice, cloves, and water. Bring to a boil; turn the heat to medium, and cook, partly covered, until the apples are very tender, about 30 - 40 minutes. Turn off the heat and let cool. 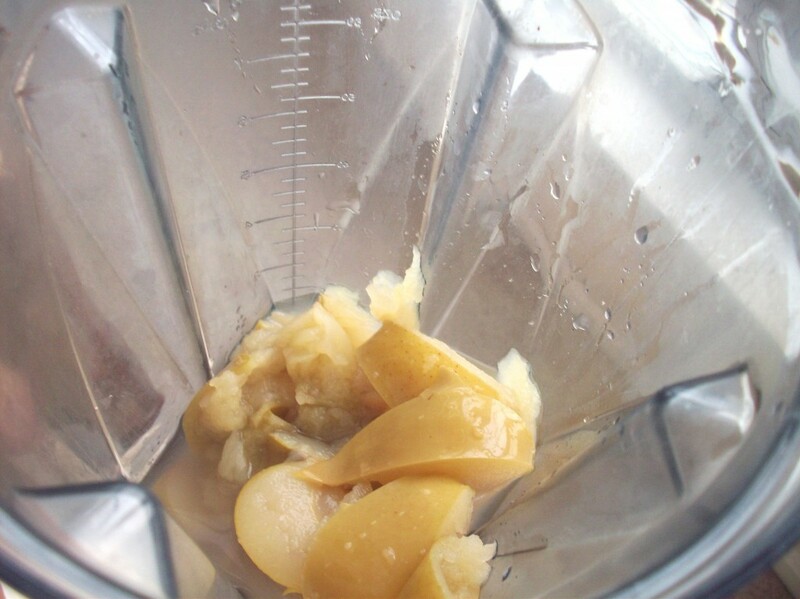 *Fish out the spices and process apples and water in the blender until very smooth, or just strain pressing the solids, and pour on a container. Add sugar to taste, and refrigerate. 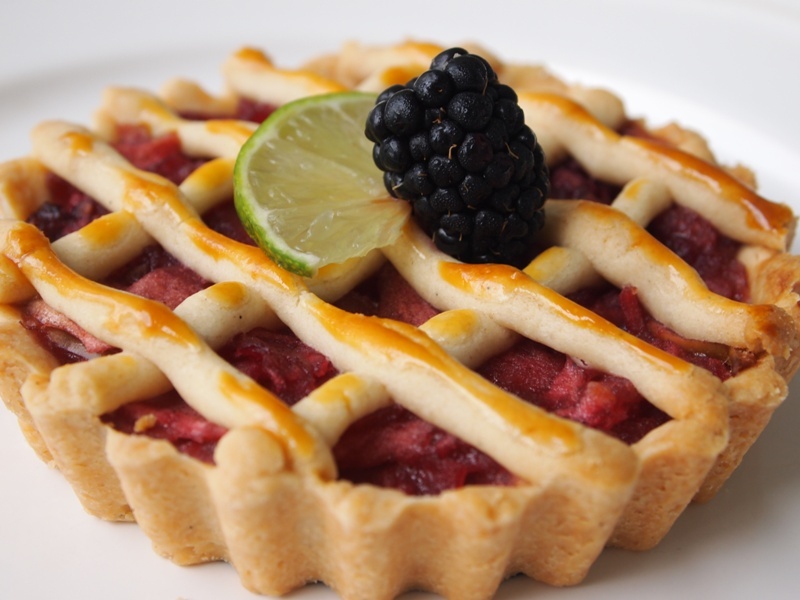 Pie de Manzana – It’s A Good Day For Apple (And Blackberry) Pie! Fun apple and quinoa flan. ‘Tis the season to be jolly! 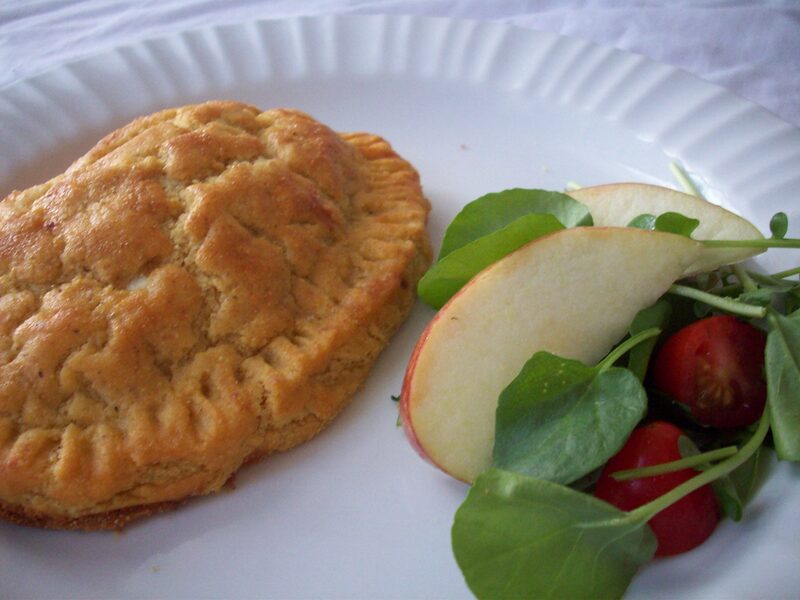 Gluten-free empanadas – Being healthy can taste good! La agua de manzana es vida, everytime that I visit your blog I feel closer to my country Bolivia, we also enjoy drinking agua de manzana, it’s great for kids! thanks for reminding me of this, I am going to make some for my children. It’s going to be their first time drinking aguita de manzana! Eliana, agua de manzana is wonderful for kids. I used to send big thermos with this delicious beverage in my children lunch boxes. They loved it. Se ve buenísimo!! Y nunca lo he probado! Como tú dices, en Colombia también acostumbramos a preparar los jugos en lugar de comprarlos hechos. Sounds so yummy! We tried apples in a juicer we had once and it just wasn’t so good but the addition of spices probably makes this version super yummy! Yum! I’ve never tried this. Looks very refreshing. Amazing that people make this and other juices from scratch! It is such a great custom and so much healthier. Thanks for the yummy recipe! Oh goodness! Looks so good. Thanks for the recipe. I need an alternative to drinking soda and this looks like a perfect substitute. 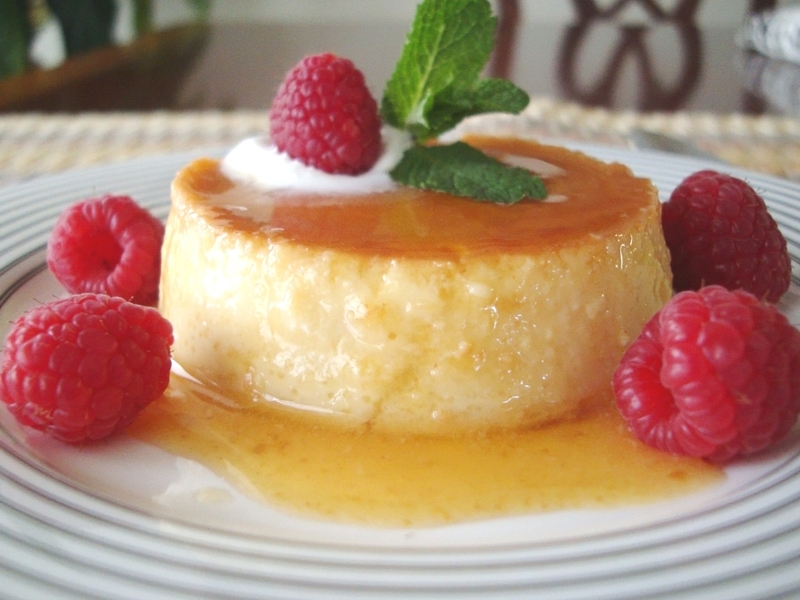 This looks great and easy to make! This sounds deliciously refreshing! A must in my cooking list of recipes. I also grew up drinking fresh fruit drinks and during the summer when fruit is most abundant around here is when I also make fresh fruit drinks for my familia. Thanks for sharing your recipe. Ay, mama. That is going on the list of to make! I love learning something new, and delicious and nutritious? It doesn’t get much better than this. Definitely on my To-Do list thanks to the lady leading the Peruvian-cuisine-next-hot-food movement! I am going to make this! Let us know how you like it, Presley’s Pantry! A Peruvian friend is staying with me right now and he cooks daily. This is a juice that we keep refridgerated always! A greart morning juice or refreshing in the afternoon. Oh to live in a paradise like Peru with the freshness of fruits and vegetables daily. You must try this one! Bravo! Yes, when in Peru, we make this water all the time and keep it in huge jugs in the fridge. We also make passionfruit water, chicha morada, and emoliente! I’d love to make this, but can’t seem to find allspice in Peru (I’m in Cusco now) – what is it called here, please? Hi! You can ask for pimienta de chapa in the markets.